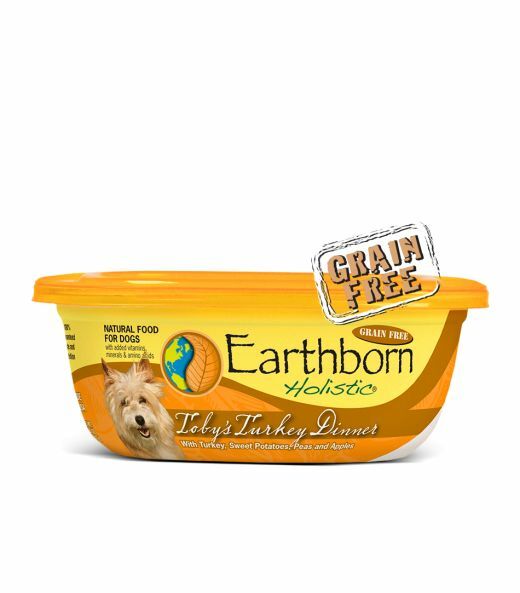 Earthborn Holistic® Toby's Turkey Dinner™ in Gravy is an excellent source of high-quality turkey protein for dogs. This limited ingredient, grain & gluten-free moist dinner is packed with whole vegetables and fruits like carrots, pumpkins, apples and green peas. This recipe also includes nutrient-rich sweet potatoes as an exceptional source of vitamins, minerals and beta-carotene which will help maintain your dog's immune system. Turkey Broth, Turkey, Dried Egg Product, Chicken, Pea Protein, Tapioca, Salt, Sweet Potatoes, Carrots, Pumpkins, Apples, Green Peas, Natural Flavors, Sunflower Oil, Calcium Sulfate, Guar Gum, Potassium Chloride, Choline Chloride, Vitamin E Supplement, Ferrous Sulfate, Magnesium Oxide, Zinc Oxide, Vitamin B12 Supplement, Copper Proteinate, Vitamin A Supplement, Manganese Proteinate, Niacin, Calcium Pantothenate, Thiamine Mononitrate, Sodium Selenite, Biotin, Riboflavin Supplement, Vitamin D3Supplement, Pyridoxine Hydrochloride, Potassium Iodide, Beta-Carotene, Folic Acid.